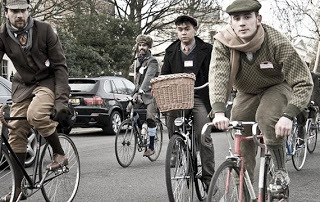 Pull out your best blazer and bow tie: this Thursday is the second San Francisco Tweed Ride. We met the nice organizer at Critical Mass on Friday. It’s inspired by a similar event in London. I can’t wait to get dressed to the nines in all my best tweed. One last hurrah before switching out my closet for summer. Yet another reason why I need to move to San Francisco! I’d buy a bike just to participate! What ho! What spiffing sport you are as the tweed can be a little itchy! Bally ho chaps!